Claimed by its maker to be the "world's most advanced keyboard", Logitech's diNovo Edge Bluetooth Keyboard for Mac is certainly a feast for the eyes with its high-gloss, piano black, semi-translucent Plexiglas finish accented by a brushed aluminum palm rest, looking spectacular as well as elegant. The diNovo Edge looks even better firsthand than it does in pictures - and it's very impressive in pictures. Build quality is superb, and the keyboard has a solid and substantial feel that belies its delicate detailing and slim profile. The aluminum palm rest with anodized-silver finish looks good alongside any Mac computer, especially the aluminum iMac and the new unibody portables, with which its black and aluminum livery harmonizes especially well. The diNovo Edge's housing is fabricated from a single-cut piece of black Plexiglas set in an aluminum frame, and the aluminum palm rest that should make MacBook Pro and aluminum PowerBook users feel right at home. To my sense of aesthetics, the diNovo Edge makes the Apple Bluetooth keyboard look like a wallflower compared with belle-of-the-ball, the Apple unit being a bit stark and anorexically thin. 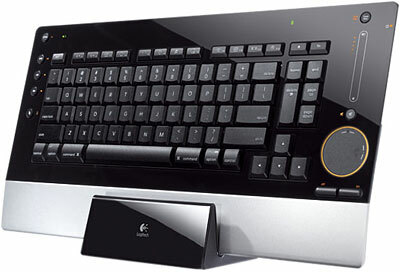 The Logitech 'board is quite slim as well, but with enough meat in its section to offer somewhat longer key travel and conventional, slightly contoured keycaps. Now I'm partial to short, laptop keyboard style key travel, and the diNovo's PerfectStroke key system key travel is shorter than a typical desktop keyboard's 3.5mm to 4.0mm, but longer than your typical notebook's (or Apple's aluminum 'board's 2.0mm to 2.5mm - the latter encompassing my ideal standards of measure - the scissor-action keyboard in the old WallStreet PowerBook and the Kensington SlimType freestanding keyboard, which are to my taste about as close to perfection in feel and tactile response as I've yet encountered. The diNovo Edge's key travel is, as noted, somewhat longer, and it will appeal to folks who prefer a more conventional key action a bit shorter than traditional computer keyboards. Its micro-scissors keyswitch design (rather than the rubber membrane domes, which are more typical of desktop keyboards these days) distributes force evenly across key surfaces, even if you strike the edge of a key, so the key stroke still feels the same, and it really is extraordinarily good. The keyboard is claimed to be the first ever wireless unit (I can't think of another) powered by rechargeable 950 mA worth of lithium ion cells, which must be recharged from time to time by inserting the keyboard in the supplied charger dock, which is also highly styled in that drop dead gorgeous piano black. It also serves as a storage stand for the keyboard when it's not in use. Logitech says a full charge takes about four hours and will last up to two months. A quick 5-10 minute charge will give you about a day's worth of power if you're in a rush. A small light illuminates on the keyboard while its charging. The diNovo Edge is also, like the Apple Bluetooth Keyboard, not a full extended keyboard with a numerical keypad; it is also short the numbers 13 through 15 F-keys. This helps make the 'board more compact, measuring a relatively trim 16.1" x 8.3" x 0.4", which will be welcome where desktop space is at a premium, but I do miss the dedicated number keys - and particularly the Enter key, which is more convenient to hit than Return in many instances. IMHO you can never have to many F-keys. I especially miss the right-hand number keys when switching between Spaces in Mac OS X 10.5 "Leopard", of which I keep nine configured, constantly switching among them, which with the Edge requires a reach to the top of the key array. I'm fairly used to being without a numeric keypad and a full set of F-keys, being a laptop aficionado, but I'm of the school of thought that external keyboards should have a numeric keypad. Something the diNovo Edge does have occupying the end of the 'board where a keypad is normally found is a built-in trackpad (a "TouchDisc" in Logitech terminology). This tiny (1.5"/38 mm diameter - or about the size of a silver dollar) TouchDisc supports "tappable" gestures just like a laptop keyboard, which is fortunate, because the commensurately tiny left and right click buttons are much too small, awkwardly placed, deeply recessed, and stiff of action that I found them little better than useless. If you're idly wondering why Logitech chose a circular shape for the TouchDisc instead of the more conventional rectangular, it's because the pad also supports scrolling gestures, both vertical and horizontal, and that certainly can be useful. Moving your finger in a circular motion from respective starting points around the perimeter of the TouchDisc lets you to scroll horizontally and vertically through documents. To scroll vertically, touch the white dot on the right side of the TouchDisc and rotate clockwise (to scroll down) or counterclockwise (to scroll up) around the perimeter. To scroll horizontally, touch the white dot on the top of the TouchDisc and rotate clockwise (to scroll right) or counterclockwise (to scroll left) around the perimeter. It's more intuitive than it sounds. According to Logitech specs., scrolling speed accelerates from a resting state to 10 times the average cursor speed with a flick of your finger. 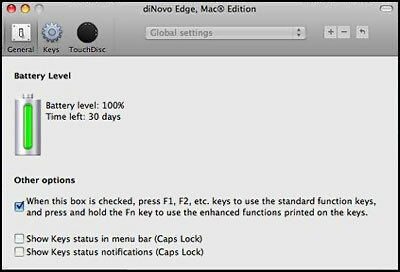 The advantage, and the point being, of course, that at least theoretically you could get along with just the diNovo Edge and no separate pointing device at all - but trust me: you probably won't want to. The TouchDisc is circular, as its name implies, and very small. It has a peripheral orange ring that illuminates when the pad is activated. 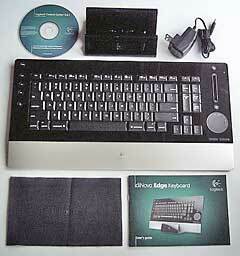 (The TouchDisc touch pad can be disabled by pressing Fn and the keyboard's left-click button at the same time.) Just above the touchpad is a volume control touch slider and a mute button. I found that they work okay, but I would still rather have the numeric keypad. 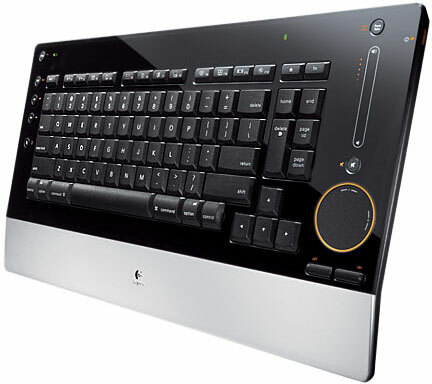 Happily, if you like the styling motif with its high-gloss, semi-translucent Plexiglas frame, sharp angles, and thin profile and the engineering of the diNovo Edge, but can't live without the numeric keypad and a full set of F-keys, you're still in luck, as last month Logitech unveiled the cordless diNovo Keyboard, Mac Edition, which retains the look and the Logitech PerfectStroke key system. On the other hand, so to speak, the diNovo Keyboard, Mac Edition, departs from commonality with the diNovo Edge in ditching Bluetooth and employing Logitech's proprietary 2.4 GHz wireless technology, which is the best of the genre I've yet encountered for either keyboards or mice. 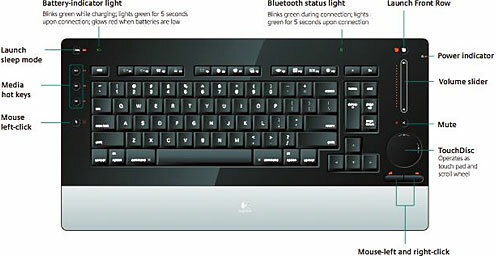 The keyboard uses 4 AAA batteries (claimed battery life is three years) instead of being rechargeable like the Edge. It's also significantly cheaper at $99.99. But the diNovo Edge uses is Bluetooth, which I consider a mixed blessing. On the positive side, you don't have to clog up a USB port with a cord or receiver if you have a natively Bluetooth-equipped Mac. Range is 30 feet, although I'm bemused as to why that's useful for a keyboard. The downside is having to muck about with Bluetooth device seeking and pairing to get set up. Fortunately, Mac OS X makes this process relatively simple and straightforward, but it's still a modestly time-consuming task. 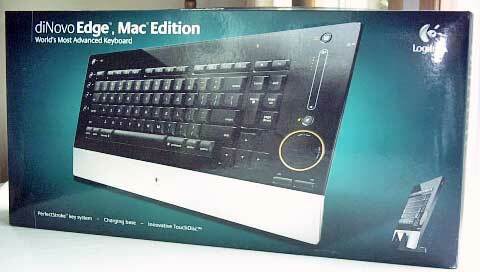 If you're not familiar with it, the User Guide that comes with the keyboard walks you through it. There is also a short latency when you wake the computer from sleep mode while Bluetooth reestablishes a connection, so you can't just hit the spacebar to make the Mac wake up like you can with a wired keyboard or some non-Bluetooth wireless ones. There is also a button to activate Apple's Front Row, if you have it (I don't, so I couldn't check that feature). The diNovo Edge's box is attractive, albeit a bit large considering the svelteness of its contents. When first unboxed, the diNovo's surface and that of the charging dock are covered with a thin, protective clear plastic film. Some users might opt to leave it in place, but if you do you'll miss out on the full aesthetic joy of this unit. The extreme glossy black reflectiveness of this 'board made me apprehensive about it showing smudges, dust, and fingerprints, but actually it's less of a problem than I had imagined. Indeed, my deduction would be that it will age more gracefully than my poor old white Kensington SlimType has, the latter now stained and yellowed with the labels beginning to wear off the most frequently used keys. 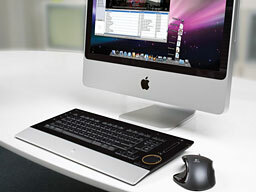 Logitech thoughtfully includes a soft polishing cloth with the diNovo, to help keep it spotless, so to speak. Actually the 'board is so lovely to look at, you do feel a bit inhibited about using it. It inspires you to make a bit of effort to keep it looking spiffy. Incidentally, don't go overboard with the spiffiness. Logitech warns somewhat ominously not to use soap or any other type of cleaning product on this 'board and to stick with the supplied soft cloth. Unpacking the box, you'll find the keyboard module and charging dock module, an AC power adapter for the charger, a CD with the Logitech Control Center driver software installer, about which more in a moment, the aforementioned polishing cloth, and a small manual, which is attractively presented and covers all the basics of setting up and using this keyboard. Another classy touch is that the latter three items are packed in a discrete envelope, printed to match the box design theme. The diNovo is supposed to come with its battery at least partly charged so you can get up and running without delay. I didn't bother checking that out and charged it before I put it to work. To charge, just plug the power adapter into the dock and drop the keyboard module into its storage slot. Two electrical contacts connect by default, and you're good to go. 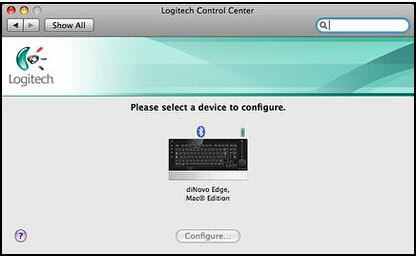 Basic keyboard functions are supported by OS X without the Logitech Control Center drivers installed, but if you want to get the full functionality - like the fn-key shift configurations and the TouchDisc scrolling functions - you'll need to install the drivers, which requires a restart of the Mac. 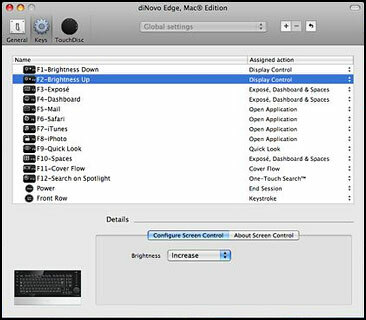 The general Control Center pane (Control Center is accessed through the OS X System Preferences) includes a battery charges level gauge and several configuration options. The Keys pane lets you assign custom functions to the F-keys. The TouchDisc pane does likewise for the Touch Disc. It's all pretty intuitive. 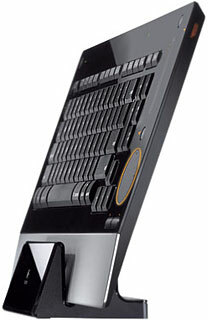 The diNovo Edge has an 84-key QWERTY layout (as opposed to 105 keys on a standard desktop keyboard), with 18x18mm keys. In appearance (other than color), it reminds me a lot of the keyboard in my 17" PowerBook. The basic alphanumeric keys are conventionally arrayed laptop-style, and the Caps Lock key has very charming and melodious chimes accompanying its on-off cycle, which helps compensate for its close-coupledness, which makes inadvertent activation more likely. There are full sets of Command/Option/Control modifier keys flanking the Spacebar (bravo!). It's to the right of the main key array that things get a bit unconventional, although there is a full-sized set of inverted-T navigation keys where you would expect them to be. North of their central limb we find a double-sized Forward Delete key and a Home key, while to the right of that row (bottom to top) are Page Down, Page Up and End keys (the latter location being something I'm finding difficult to get used to). Then across the top of the 'board are, left to right, an Escape key, the 12 F-keys, an Eject key, and a fn key that allows you to assign optional functions to the F-keys when the Control Center software is installed. Over on the far left periphery are a set of tiny, flush-recessed multimedia control keys, and at the very top a Launch Sleep Mode key. The 57 mm touch-sensitive vertical strip volume control slider on the right increases or decreases audio volume as you move your fingertip up or down and has orange dots that light up where your finger is, following its track until you release it from the keyboard. During Front Row playback, the volume slider on the diNovo Edge keyboard duplicates the functions of the + and - buttons on the Apple Remote, adding more fluid control and visual feedback. What else? Oh yes, there are a couple of flip-down legs at the back of the keyboard for those who prefer that ergonomically incorrect mode. I prefer my keyboards flat. As you may have deduced by now, I'm very impressed with the Logitech diNovo Edge Bluetooth Keyboard, although for personal use I would be more inclined to opt for the full 105-key diNovo Keyboard for Mac. The Edge's main downsides are the lack of a numeric keypad and its price, listing at $159.99 for the Mac version, which is happily 20 bucks less than the Windows version, thanks presumably to not having to include a USB receiver dongle with the Mac unit. Let's see: You could get five Kensington SlimTypes for that and have change left. However, all the high-end goodness in the diNovo does cost money, and third-party resellers may sell it for less than $160. I'm giving the diNovo Edge Bluetooth Keyboard a 3.5 out of 4 rating.